Most mammals can jump, and several groups including cats, hares, galagos, lemurs, antelope, goats, springhare, kangaroo rat and kangaroo appeared to be specialized for this lively means of locomotion. The potential survival benefits of enhanced jumping ability are obvious, in coping with obstacles in the environment, pouncing to catch prey or leaping to avoid predators. For arboreal (tree-dwelling) animals, jumping is an essential part of travelling between branches, and for gliders, it is crucial element for a successful take-off. Many forms of jumping involve the rapid extension of a pair of limbs, and for quadrupedal mammals, this is usually the hind legs. 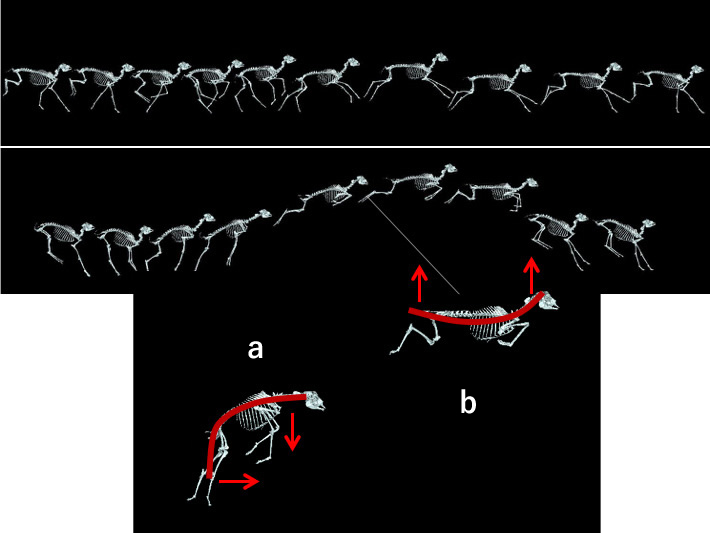 However in some mammals, including several small- and medium-sized antelope, the part of jumping force comes from the spine. There are mammals that perform hopping by hind legs like as kangaroos (bipedal ricochet). The trajectory of a jump has two components – height and distance, and the magnitude of each is dependent on both mechanics and technique(ref.1, ref.2). The snow leopard is arguably the most accomplished mammalian jumper. These exceptionally beautiful big cats live in rugged mountainous and steppe terrain, among crags and tough, shrubby vegetation. Their prey includes wild sheep and goats, hares and birds. When hunting, snow leopards routinely leap horizontal distances of 6 to 15m and up to 6m in height. The leap is achieved by rapid pulling of the forelegs and extension of the spine and hind legs. When leaping to such heights, landing becomes just as important as take-off, and the snow leopard does this safely using flexion of the feet, leg joints and spine to absorb the shock of impact. Fig. 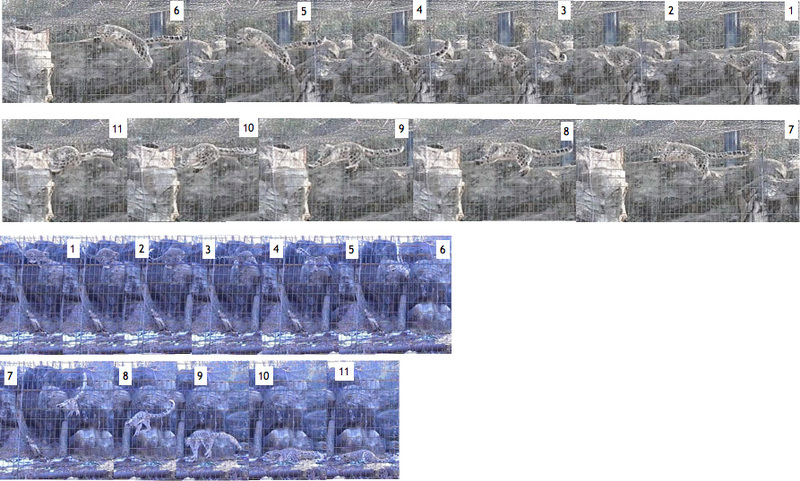 18-2 3D CT scans showing skeletal characteristics of Snow leopard. Snow leopard has flexible spine, strong legs and developing fingers. Medium- to small sized antelope like the springbok, Thomson’s gazelle, impala, dik-dik and blackbuck are both fast sprinters and excellent jumpers. The blackbuck is native to the Indian subcontinent. Adults range in weight from 31 to 45kg and males are distinguished by their beautiful spiralling horns, often more than half the length of the body. Blackbuck have been recorded running at more than 80kmph (50mph) and leaping obstacles more than two metres high while running. But the technique used by leaping antelope differs considerably from that of cats like the snow leopard. While a cat jumps mainly by quick extension of all joints in the hind legs, the antelope uses elastic energy stored in the long tendons of the leg and in the spine to catapult it into the next leap (ref.6). Continuous picture showing a leaping female blackbuck. 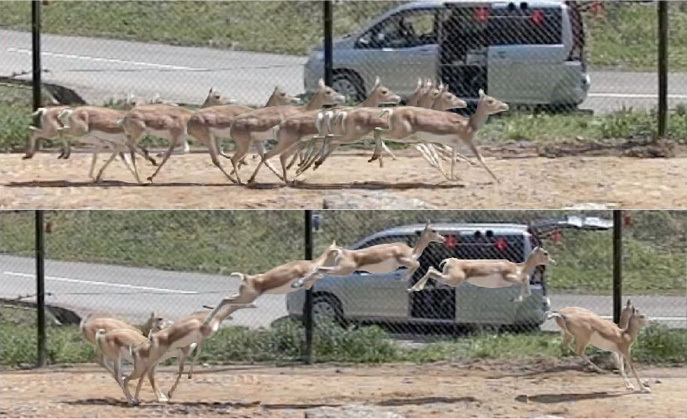 Blackbuck can perform repeated leaps of various height during running. Fig. 19-2 The blackbuck’s spine flexes as the forelimb and hind limbs extend(a), storing elastic forces which are released to power the next leap(b). 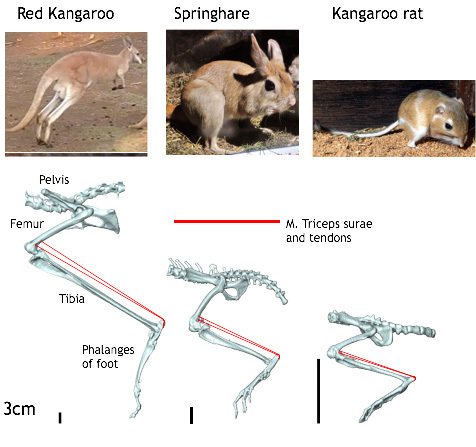 Fig.20-2 3D CT scans showing the ricochetal skeletons of hind legs of the red kangaroo, springhare and kangaroo rat. Leaping is the characteristic locomotion of several species of prosimian primates including forest-dwelling lemurs and the bush babies, or galagos. Typically, leaping is performed in trees to carry the animal from branch to branch, or trunk to trunk. Leapers tend to have relatively long hind limbs and a long, flexible spine. Propulsion comes largely from extension of the hind legs and spine, while landing is controlled by the forelimbs. The muscles of the hind limbs of the galago account for 25% of the entire body weight and produce powerful propulsion. Galagos can achieve a vertical jump height of 2.25m – remarkable for an animal little bigger than a rat ( ref.15 ).